Daintree Valley Haven: A new species for our bird list? When a guest told us yesterday he had seen a turkey on the property we really did wonder if he'd drunk perhaps a little too much festive cheer. Then this morning I looked out of the office window and this is what I saw - it looks as if someone's Christmas dinner has escaped! 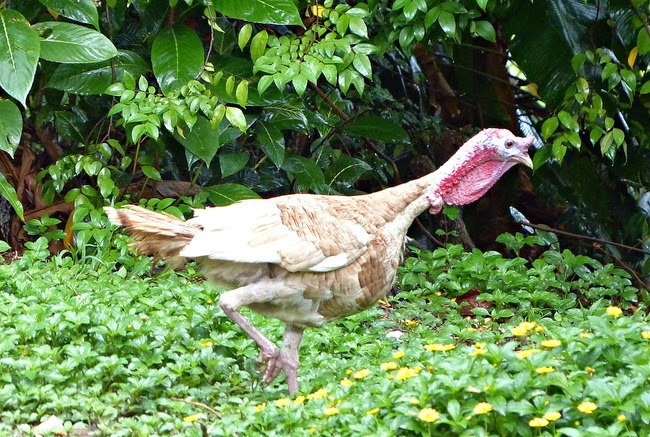 Not being familiar with domestic turkeys we weren't sure at first if it's male or female but a Google search assures us that only males 'gobble' - and this one is certainly very vocal! He's now enjoying munching through yesterday's thrown-out veggie scraps (also enjoyed by our Bandicoots, Wallabies and assorted other wildlife).